I think it depends on if there was a contract or not. Maybe if you have an adoption through an agency, you might have to sign something that says that you'll submit pictures and updates every so often, and whether or not you follow this would be between the adoptive parents and the agency. Technically, if it's through an attorney, unless there's something in a signed contract about it, the adoptive parents CAN change their minds and close things off. I do know that this has happened and it makes me sick, but I can't do anything about what others do-- I can only do the best for our situation. I think it depends on the adoption. We don't have anyone acting as a go-between regarding communication now that the adoption is final. When we were going through the process, our attorney acted as a go-between to a certain extent, but for the most part, we just talked things out between ourselves and the birth family. I think it's a good idea to have someone there to help discuss the details that might be hard to talk about- for example, will the mother hold the baby/see the baby after delivery? Will the adoptive family be in the hospital room? Waiting room? Come after so many hours? Once the baby is born and temporary custody is signed over, what will happen? Will the adoption be open or closed and what would the terms be? All things that would be beneficial to have someone else work out-- someone not emotionally involved with the two parties. The disadvantages would be that it takes some of the connection away and puts a wall up between the two families. In the case of an open adoption, both families should be discussing these things together-- but until custody is signed over, the birth family has all the rights and it IS very scary as an adoptive family. I think it depends on the agency. There ARE some shady agencies out there. Some even charge more if the baby is white... which I think is RIDICULOUS. So... I suppose it could cost more, but I would certainly not go with an agency like that. I think agencies try to get as much money as they can, and adoptive families are usually in such a state of desperation (some... not all) that they (the agencies) know they can charge for just about anything, and these people (adoptive families) will pay because they REALLY want a baby. I would assume that if the contract states so much contact and whatnot, that there could be a lawsuit from the birth family. However, I don't know for certain. It's no different than anyone else coming to your house unannounced. In most cases of open adoption, the birth family doesn't know the address of the adoptive family-- but if they did, they wouldn't be any more inclined to just come over unannounced than anyone else would. It's funny (not really funny) that there are a LOT of birth mothers out there that have a VERY bad view of open adoption. Probably because they were told one thing and then the adoptive family switched it up and now they have no contact, which is against open adoption. There are groups that do work to be the voice for birth mothers. I find them not very friendly towards adoptive parents and I try to avoid reading too much from them because it upsets me. I'm an adoptive mom... I love and respect our birth family... and I'm not a bad person. I think when a child is 18 and considered an adult, they have the right to determine what they want in their life. Up until that time, it's my job as a parent to make sure that my son knows his birth family. When he's old enough to vote, he's old enough to decide if he wants to continue to stay in touch with them, or to cut it off if he chooses. I'll support whatever decision he makes. I would hope that he'd remain close to them, as they're as important as any other member of our family is. Your answers to Q3 made me think, Cathy, especially about the connection. After all, that does tend to strengthen when you work things out directly. Good luck with Gus and with the OA you share with his birth parents. Thanks for participating! 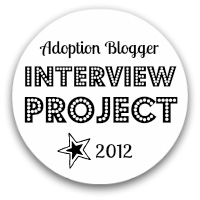 My blog that's specifically about open adoption and how our family came to be complete. I'm Cathy and I'm a former elementary teacher turned SAHM. This blog has grown and evolved through the years to be my sounding board, then a place to share my thoughts, fears, and celebrations, and then where I post pictures and practice my photography skills. I blog about daily happenings. To read more about my family and how we're connected to open adoption, please follow our family blog: A Completed Family. All content © 2011 Cat's Litterbox | All Rights Reserved.